All too many of us are skimping on sleep. 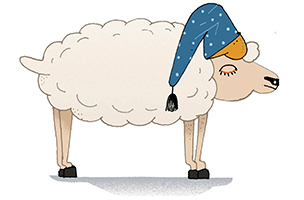 Why is shut-eye so important – and what happens when we don’t get enough? In bedrooms across the globe, people are tossing, turning, texting, and skimping on sleep. Tiredness is the new norm. And for many of us, a good night’s sleep is just a dream. Statistically speaking, research from World Sleep Day reveals that sleep deprivation is currently threatening the health, happiness, and productivity of up to 45 per cent of the world’s population. Sleep experts the world over agree that the world needs to wake up to the fact that we are in the midst of a global a sleep crisis. Science has linked poor sleep to all sorts of bad stuff, including a weakened immune system, high blood pressure, weight gain, low libido, mood swings, paranoia, depression, a higher risk of stroke, cardiovascular disease, diabetes, dementia, and cancer. Still not convinced? Well it’s not just our bodies and minds – efficiency and productivity also suffer when we’re tired. And not surprisingly, fatigue raises the risk of traffic accidents, medical and occupational errors, and industrial disasters. Need proof? Remember the nuclear disaster at Three Mile Island? How about Chernobyl? The Exxon Valdez oil spill? Or the breakup of the NASA space shuttle Challenger? Do a quick Google search and you’ll find that these and many other major disasters have been directly linked to sleep deprivation. “When you’re chronically sleep deprived, your body literally takes over and ‘forces’ you to fall asleep, even when it may be highly dangerous to do so,” notes Culpin. Anyone who thinks they can “cheat the sleep system” is fooling themselves. Anyone who thinks they can “cheat the sleep system” is fooling themselves. So what’s up with all the super-successful celebrities, world leaders, and athletes who claim to need almost no sleep – the “sleepless elite,” like Barack Obama, Martha Stewart, Bill Clinton, and Donald Trump, all of whom claim to sleep only four or five hours a night? “There’s a very powerful quote by an eminent sleep researcher who said that the number of people that need less than five hours sleep a night is so low that if it was rounded up, it would round to zero,” Culpin says. The majority of research looking at the serious physical effects of chronic poor sleep often find that six hours is the critical cut-off. Based on her extensive work with business leaders, professor Culpin notes that one big problem is that all too many of us find ourselves not only working too much but bringing our work into the bedroom: midnight email sessions propped up on pillows, Skype meetings across multiple time zones, and burning the midnight oil to prove our dedication to our careers. How much sleep do we actually need? Culpin says that because of age, genetics, environment, and individual differences in daily physical and mental strain, there can be huge variations in ideal necessary sleep times. But the National Sleep Foundation says most adults need between seven and nine hours of sleep to function optimally. In addition to treating “regular” sleepers, Tuomilehto has studied and coached over 1,000 of the world’s top professional athletes, including the NHL’s Columbus Blue Jackets, Helsinki’s HJK football club, and Finnish Olympic Committee athletes, helping them to enhance their performance, one good night’s sleep at a time. A 2017 study led by Tuomilehto and his team at the University of Eastern Finland and Coronaria Sleep Clinic analysed over 100 professional ice hockey players’ sleep and found that a whopping one in four suffered from major sleep disorders. And, surprisingly, the vast majority of them aren’t getting anywhere near the 9 to 10 hours of sleep they need. Even if you don’t happen to be a world-class athlete, Tuomilehto’s pro tips can help anyone looking to up their sleep game. For starters, “you have to cool down after the day and warm up for sleep, Tuomilehto says. For some people that means taking a nightly walk around the block. For others it’s meditating, taking a hot bath, or doing whatever helps you clear your mind before bed. “You aren’t going to have a good sleep if your mind is a mess,” Tuomilehto says. According to Tuomilehto, watching TV on your phone with one eye on your Instagram feed and another on your email is definitely not a recipe for a good night’s sleep. It’s best to avoid using your devices at least two hours before bed. Sleep is all about rhythm and pace, if you routinely activate your brain towards the evening, the chance for good sleeping is negligible. So, it’s time to put to bed the idea that sleep is a luxury, or only important for babies, and wake up to the fact that it truly is a central part of every aspect of our lives.